Commitment works best when we approach it as a method of personal growth. Ultimately our loving relationships are the most gentle and effective education we engage in to become the person we want to be. By creating an ecology in which love can thrive and be sustainable, we can solidify and enliven our primary relationships—by strengthening the relationship’s foundation, improving communication, understanding what it means to truly be together (even when apart), being comfortable with our own sexuality, and keeping the fire of intimacy burning bright. This book is dedicated to guiding that work. Wendy’s first book, built around years of her Sustainable Love writing, tackles the challenging issues of sustaining relationships and creating healthy intimate lives. Critics have acclaimed that Love That Works is an essential handbook for the daily practice of learning to cultivate the renewable resources of loving relationships and family. Wendy has an empathetic soul and exuberant voice; while reading her book, one is filled with the sense that she is not just talking to us, but listening as wel. Wendy Strgar has given us a road map to more satisfying, sustainable relationships. 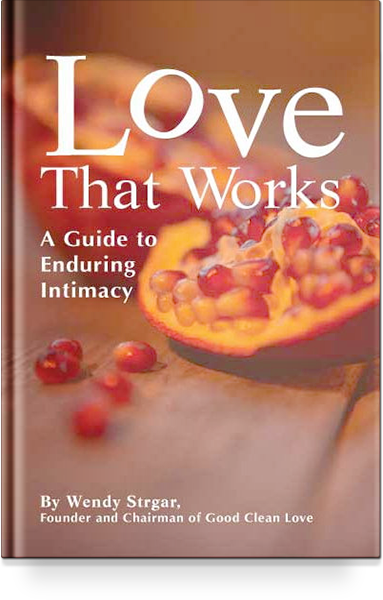 This is an excellent book that anyone who is partnered or married should own… One of the best books I’ve read about the hard but rewarding work of what it means to love. Love That Works is the playbook of love. Love is a complicated sport and Coach Strgar lays out the x’s and o’s to help you succeed! It is a practical, every day guide to understanding and managing your love life.